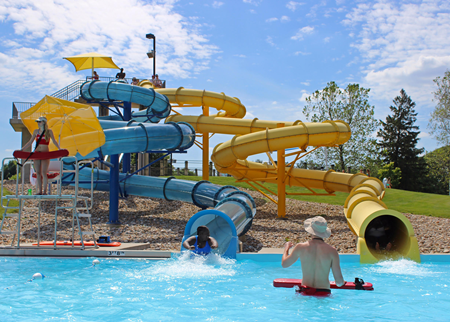 Pay just $45 for a 10 Visit Pass for the 2018 Season at Sholem Aquatic Center in Champaign ($90 value). USE YOUR 10 VISITS IN ANY MANNER YOU LIKE FOR THE 2018 SEASON! Nothing says summer like spending time at the pool! We look forward to summer every year and hope you can join us at the Sholem Aquatic Center! Enjoy the many amenities like the tube slides, lazy river, kiddie pool, lap pool, and huge main pool. You and your family won’t want summer to end! Join us time and time again with TheGotSpot.com punch card. In addition to great open swim options, we also offer learn-to-swim programs for people of all ages, after-hours rentals, birthday parties, Junior Lifeguard training, Special Events, and more. The 2018 swim season runs from May 26 – September 3, 2018. -The Beach is our 8,000 square foot main pool that includes a zero depth entry, play and spray features, and dump buckets. -The Puddle, our baby pool, is made for our littlest swimmers and features a zero-depth entry, a slide that’s just right for little tykes, and plenty of seating and shade for grownups. -The Sea is our crystal clear, always cool, 8-lane 25-yard lap pool. 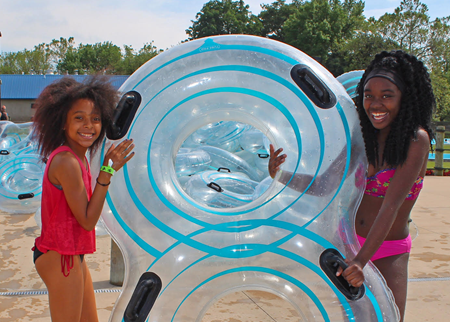 -The Rapids is a 660-ft winding river designed to guarantee fun in the sun. -The Falls is a 170-ft tube slide that’ll spin you down, twirl you around, and splash you and your tube out into The Rapids. -The Plunge &amp; Blue Rush are our 197 foot long enclosed body slides that empty out into the splash pool (Must be at least 42” tall to ride). -The Oasis concession stand offers great eats and treats at reasonable prices with plenty of seating in the sun or shade. -Sholem Aquatic Center patrons are protected vigilantly by our internationally-recognized and award winning Jeff Ellis &amp; Associates® certified lifeguard team. -Coast-Guard approved lifejackets are available to borrow free of charge for adults and children. -Three beautiful shaded rental lawns that are available for your next party or event. 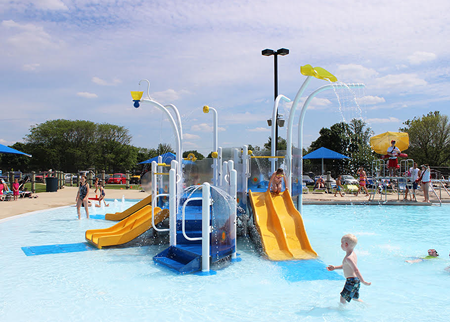 The Champaign Park District’s Sholem Aquatic Center has been awarded the prestigious “Platinum International Aquatic Safety Award” for its high level of achievement for many consecutive years, including the 2016 season. Earning this award demonstrates that the Sholem Aquatic Center staff consistently exceed industry standards in risk management and epitomize aquatic safety excellence. Note, once you redeem your voucher for the 10 visit pass you may use the 10 visits in any manner you choose. They do not all have to be redeemed in one visit.